Check out our exciting new seasonal job opportunities! The 2019 season is quickly approaching! Please ensure your SIR Growers Profile is up to date with your new phone number, email address, or lease block information. Learn more about our New Pest Management Support Program now available for Okanagan fruit growers. SIR staff check codling moth trap in all orchards weekly. Check here for your weekly orchard trap counts. Degree days indicate the predicted stage of development of codling moth populations near specific weather stations. All property owners with apple or pear trees are responsible for controlling the codling moth on their property. Working directly with growers and residents, the Okanagan-Kootenay Sterile Insect Release (SIR) Program is a safe and innovative way to control the codling moth population, and reduce the use of pesticides. 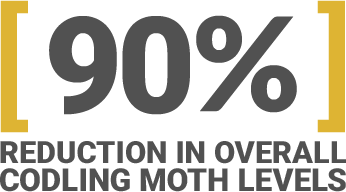 Since OKSIR’s founding in 1992, both the codling moth population and the amount of pesticides used per acre have decreased by around 90%, building a stronger and healthier BC fruit industry. 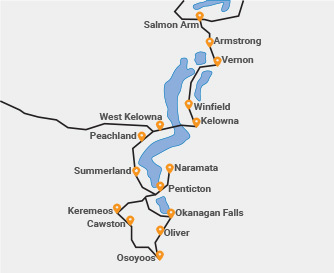 OKSIR’s control region stretches from Salmon Arm in the North down to Osoyoos in the South. This includes all or portions of four regional districts including the Regional District of the Okanagan Similkameen, the Regional District of the Central Okanagan, the Regional District of the North Okanagan and the Columbia Shuswap Regional District.